We’ve been looking back at all the things we got up to at the charity this year but here’s a few memories from Kate and Harri. Kate and Harri look back over some of their Gig Buddies highlights of the year. The unexpected connections that have arisen out of getting to know each other and finding you have things in common that you didn’t expect such as Liz and Dan’s puppet passion which turned into them making puppets together, running workshops for children with disabilities and going to puppet productions together. The request from participants to start a sub group for LGBTQ+ buddies to socialise and get support from people they can relate to and feel totally understood by. The way everyone pulled together with outpourings of love for Simon when he died, realising the huge impact and inspiration his life had on so many people. The utter joy in the room when Heavy Load reformed to perform a chaotic and brilliant karaoke tribute gig. Being fully embraced in a community of people based on a simple shared interest. Although it’s great to raise awareness of who we are and what we are doing sometimes I like it the most when we able to hang out together in mainstream venues almost anonymously just like a group of mates would. Victoria’s inspirational speech at Chester conference about her pride of getting a job and telling people not to worry, with some adjustments it is possible to support people with learning disabilities thrive at work. When Tom’s brother met up with us at Glastonbury festival and cried with joy when he said goodbye to us, explaining how thankful he was to see his brother at a festival – he never dreamed he’d be able to hang out with his brother at such a big event but with the right support he loved seeing how independent he was, and was particularly impressed with his brothers campsite cooking! 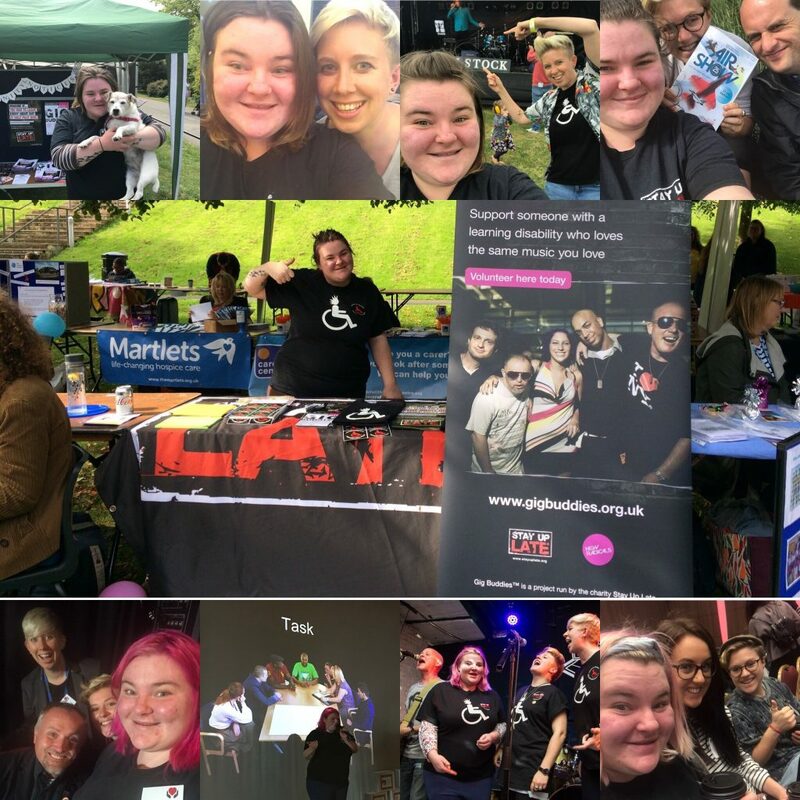 Gig buddies was about creating links in the community but its created a whole community of it’s own and the way the learning disabled community has embraced me as an individual has been life changing. The fact that one of the questions in the outcomes in the big lottery funding is ‘do you have any friends with a learning disability?’ and now I genuinely do have loads of friends, who happen to also have a learning disability. Victoria decided to do her highlight as one photo collage. And what a great thing it is to look at. It is almost impossible to pick out only a few highlights from the last year. With over 40 gig buddy socials, attending 3 major festivals, hours of Storm and Thunder meetings, 5 Wild Rainbow get togethers, radio interviews, ping-pong parties and huge amounts more I would need a whole other year to explain the best bits! I think some of the most brilliant moments throughout the year are when you can see the projects ethos and values being turned into reality. It doesn’t matter whether its dancing until the early hours at Latitude festival or chilling at candle lit open mics in Eastbourne. What is clear to see in all these scenarios is the effect that community, choice and opportunity have on people when it is given to them freely. Participants who were once unable to travel to venues independently or order at the bar have become friends with other gig buddies who peer support each other. This has resulted in many participants being entirely independent of support when they attend socials. Watching the participant’s confidence rise, social circles expand and independence increase through joining Gig Buddies is priceless. Hearing this feedback from participant’s support and volunteers is certainly a highlight of the job.